There’s still mud in my hair, I’m shuffling around like I just ran a marathon and I’m currently hen pecking the keys to type this post because my hand is a gooey mess of blistered, open skin and embedded micro rocks. But I can cross off number 25 on my 40 by 40 list: run a Spartan Race. 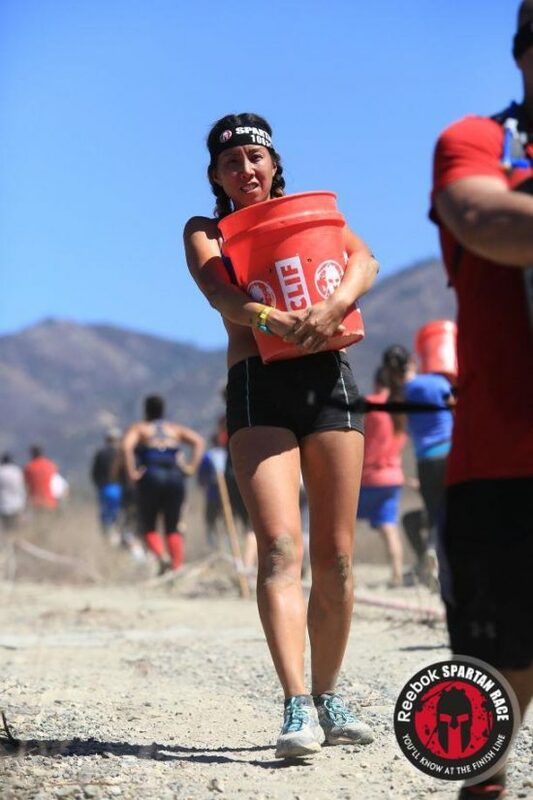 The weather was a toasty 100 degrees out at the Pala Raceway this weekend and I was overconfident in my ability to endure a measly 4.6 mile run with a few obstacles tossed in there for the Spartan Sprint. 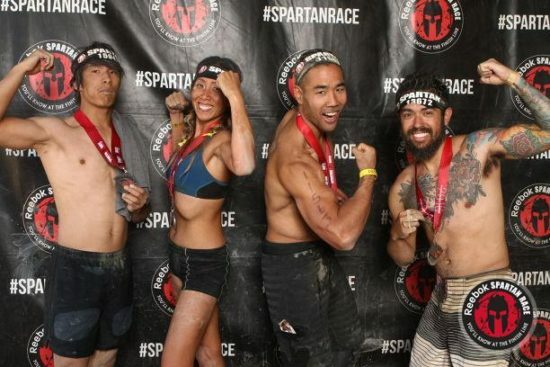 After all, 5 miles is a typical weekday run so that should be a non-issue and how hard could a sprint be when just 24-hours before hundreds of people did 10-14 miles for the Spartan Beast? But I quickly learned a few things during my slowest 4 miler ever (23:17 per mile!) as I wandered half delirious through the maze of dirt, hills, ropes and mud, dehydrated and delirious and really hating life (as seen on my face in the pic below). Mmmm…margaritas. They were quite tasty while watching my USC Trojans get their asses handed to them at the bar the night before the race. I refused the goading of my friends as they told me to drink more and I only refrained to having 3 cheese curds (darn you, dairy intolerance). After all, I thought to myself, it’s less than 5 miles and I have been fairly consistent in my strength workouts. I’m sure I would be challenged at points, like climbing the rope since I can’t climb ropes, but the rest of the race should be cake. Proud of my discipline, I headed to bed early for a typical, night before a race, restless slumber. I didn’t factor in the 100-degree weather or dehydration. Why did I pay good money to carry a bucket of rocks up a hill?! I had no electronics on me – my fragile Apple Watch would’ve never survived the beating of a Spartan event and so most of the race left me wondering when it was going to end. There were no mile markers and halfway through the course, you begin to see the finish line, and you think, you hope, that you are close to being done. You’re not. It’s just part of the mind games they play with you. I shimmied up a muddy hill, careful not to be speared by the barbed wire overhead, trying to ignore the rocks and terrain tearing up my knees as I dragged my tired body in an army crawl. That sucked. But the worse was yet to come. Thinking back before the race, when we entered the Spartan area, we noticed a sign that had a vendor selling gloves. Do we really need gloves? Nah. Do we need a Camelbak hydration pack? Nah. It’s only 3-5 miles I told my team. No one should ever listen to me. As I carried a bucket of rocks up a hill with my hands already scraped and popped blisters screaming at me, I really wished I had that pair of gloves. But never more so than when I dropped a 75lb sandbag tied to a rope that I was trying to pull 35ft up into the air..and I forgot to let go of the rope. Buuuuuurrrrnnnnnn…..
By mile 2, I could feel my parched lips with my tongue and again cursed the fact that I drank those margaritas instead of a gallon of water to prep. By mile 3, I looked like I was drunk, weaving and bobbing through people and running/walking up and down hills. I deliriously complete a burpee penalty…or three. I lost count. I kept losing count during the burpees too; did I do 10 or was that 20 already? A nice lady offered me a gummy (which make my stomach hurt) but by that point, my body needed help and though my mind screamed, “Noooooo!” I found myself reaching out and taking her offering with my muddy hands and hungrily chewing the sickly sweet energy gel. I spent the next half mile wanting to vomit until I finally came upon a water station. But the hours training for marathons did pay off as the sun beat down on my sweaty body. The sunblock had worn off ages ago and I could feel the heat burning into my skin. I recalled my first marathon a year prior and resolved never ever to run another Spartan again. If I survived this one. At points, I was equal parts talking trash to myself and giving myself pep talks like a schizophrenic. People all around would call out encouragement to each other and one man asked to no one in particular for someone to inspire him. I was too tired to say anything, but his plea encouraged me to carry on up the hill for another few feet without stopping, with the hopes that my grit could telepathically bring him some motivation. Then finally, I knew the end was near for sure. The lady at the last water station said we had a half mile to go. This gave me some renewed energy. That and the three cups of water I thirstily drank. The last few obstacles had me stopping, taking a deep breath and mustering up the last of my will and determination to sail through the final hurdles. It never felt so good to finish a race and get that medal put around my neck. And I that’s why I’m signing up for another Spartan Sprint in 10 weeks. The feeling of crossing any finish line knowing that even though it got really ugly in the middle, you had the mental fortitude to battle through it, is an indescribable feeling. Knowing that you were able to pushing yourself to near breaking point and emerging victorious on the other side, battered and bruised, but a better person for it is addicting. Plus I want to try it without the margaritas next time. Whether that mountain is clamoring over a ten-foot muddy wall or walking out of a broken 11-year relationship, the cuts and bruises will fade, but in the end, when you cross that finish line, you are a better person for having lived through it. The One Who Wanted A Hug	Hello? Is This Thing On? !